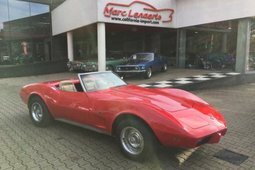 Absolute wonderful custom complete body-off restoration 1973 Corvette Convertible in Candy Apple Red three stage paint. 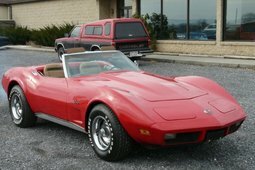 The car has fiberglass front bumper cover with new grilles and park lamps, re-chromed rear bumpers, custom 18" wheels, luggage rack, Oyster White interior with custom embroidered two-tone seats and restored gauges, heater and air conditioning control, CD Player and a white convertible top. Custom wheels with painted spoke inserts that can be removed for an all chrome look. The car has a rebuilt 350 cubic inch non-original motor with mild cam upgrade, polished aluminum intake and valve covers, original 4-speed with new clutch, new U-joints in driveshaft and axle shaft, rebuilt rear and front suspension, rebuilt power steering, rebuilt brake system, new fuel lines, brake line hoses, new gas tank, new exhaust system and bezels, new wiring harness. Rebuilt air conditioning system and new radiator, rebuilt headlamp and vacuum system, new windshield and side windows. Work for over $150,000 was done to the car. 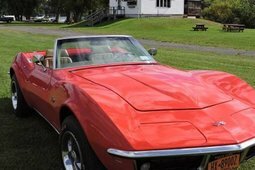 The car belonged to the director and star of the 4 Emmy award-winning film "White Men Can't Dance" Peter S Vinal before being sold at auction at Barrett Jackson, Reno, Tahoe in August of 2013.